The Pyzel Padillac isn’t your typical step up or semi gun. This board was purposely built for incredible paddle speed in open water to help navigate and surf deep water breaks like Ocean Beach in San Francisco and Sunset Beach in Hawaii. The Padillac starts with a wider than average nose and flows smoothly into a full figured big wave outline. 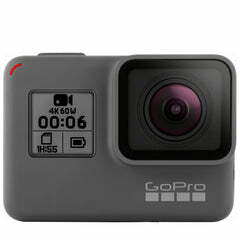 The foam foil also shows considerable thickness concentrated under the front half of the board. Combined, this has the Padillac using its entire length and volume to get you into waves earlier and helps you track down the sets of the day with confidence. Whether you’re an advanced surfer looking to score the wave of the day, or a charging intermediate looking to up your big wave game, what you’re looking for in a board like the Padillac is exactly the same. 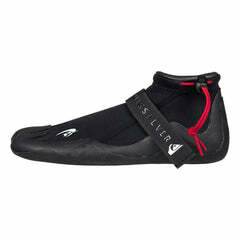 Paddle speed, control, confidence, durability and the ability to turn at ridiculous speeds. The Padillac makes surfing the biggest waves of your year significantly easier, all while surfing them at a higher performance level. We packed an 8’0 Pyzel Padillac on a recent two swell strike mission to Villa Sessions in Puerto Rico. Right off the plane we surfed the Padillac for two days straight, in double to triple overhead surf, and then again as swell number 2 started to pulse the following week. This board oozes of confidence from the moment you lay eyes on it. The front half of the board is designed to get you anywhere fast and paddle into bombs with confidence. The back half narrows and thins out pretty quickly, which makes controlling the Padillac, and even aggressively turning the Padillac, a reality at the ridiculous speeds you’re hitting on bigger waves. When you pull into the parking lot and it's breaking way outside, you'll be glad you brought the Padillac. How fast is this board and what type of speeds are we talking about? 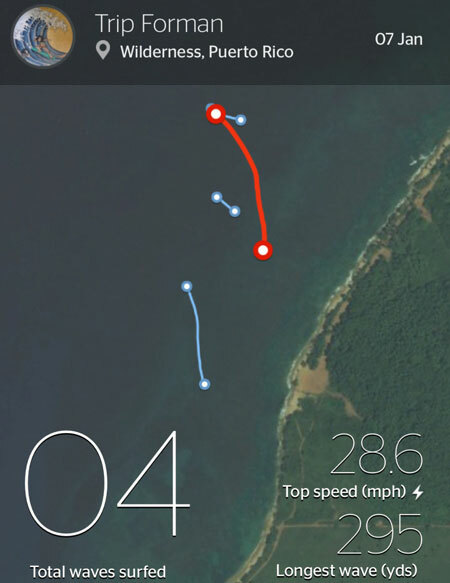 Well, a typical good shortboard wave measured on the Rip Curl GPS Watch has you going around 14 mph. A really good “wave of the session” type of ride has you going 17-18mph. Our first wave on the Pyzel Padillac clocked in at 28.6mph. What?@! The second wave clocked in nearly as high, high enough to make us scratch our heads and ponder the possibility of the watch being broken or having switched over to KPH for measuring units. We reset the watch and went the rest of the day with waves well into the 20’s mph range. The crazy thing about it was that while it obviously felt faster, it didn’t feel like you were going twice the speed. It felt totally in control, especially given the size of the surf. Plus, at those speeds, you were able to turn the board whenever you wanted to, and turn it hard, while on other boards you would have been bleeding speed and waiting to turn. Pretty impressive. Scratch that. Really impressive. When we talk about “deep water” breaks and “navigating” the lineup, some people don’t understand what that actually means. A lot of bigger wave breaks unload well out into the ocean, pretty far off the beach. The further you paddle out, the larger the lineup grows exponentially. This makes paddle power a key performance characteristic when surfing waves like these. Paddle power and paddle speed help you shift around in the lineup and cover ground quickly to either track down that set wave, or when the horizon turns dark blue, get out of the way of clean up sets. Too many times on smaller boards, you literally feel lost out there that far off the beach. You can’t paddle to get to the waves. You can’t paddle fast enough to get into the waves and you can’t paddle fast enough to get out the way when you need to. When you’re feeling all three of these, you know it’s time to bust out the Padillac. Most boards in this size range are either blown up compact step ups with too much volume or needled out, pro level boards that are great for taking off under the lip, but don’t offer the "easy in" of the Padillac. The Padillac is unique in its sizing, dimensions and volume to give you the right combination of paddle to performance in conditions that demand confidence. 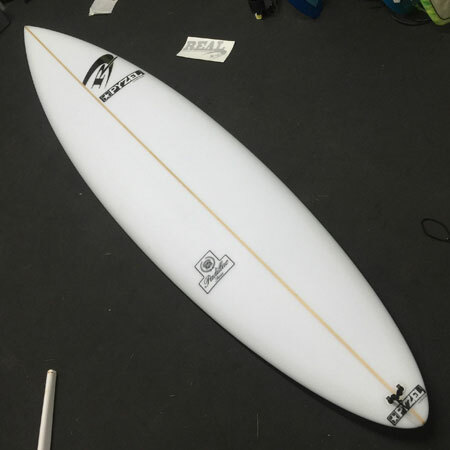 Its full figured, big wave outline combined with shallow bottom contours and narrow tail give you enough width for stability and some outline curve, plus control at speed when you're red lining in bigger surf. Padillac 7'8", 8'0" and 9'0". Futures EA Fiberglass Quad Fins in the Pyzel Padillac. 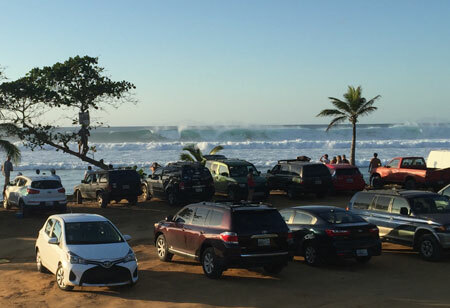 The last, or first, thing to consider in bigger surf is durability. Pyzel steps up the construction on his Padillacs to make sure they last in macking conditions. The stringers on the Padillacs up to 8’ in length are ¼” wide solid basswood, and above that are ½” solid basswood. The glass schedule is beefed up to 2 x 6oz on the deck, and 1 x 6oz on the bottom. (Standard shortboards are 2 x 4oz deck and 1 x 4oz bottom). Even the foam itself is more durable, using an Arctic Green Density Foam blank (higher density foam) which is stronger and heavier. All of these reinforcements add weight, but in this board weight is a good thing because it helps you get down the face and carry momentum. Even the leash plug is doubled up to spread the leash load 50/50 across two plugs and reduce the chance of ripping one out. With the narrow width of the tail area on this board, you want to make sure you don’t over fin it. Even at 215lbs, I was riding medium sized fin sets and never felt like I was lacking drive. This is because narrow tails balance out with smaller fins, and also because when you’re surfing at higher speeds, the fins generate more lift and you can surf smaller ones and have the same feel as your other boards. 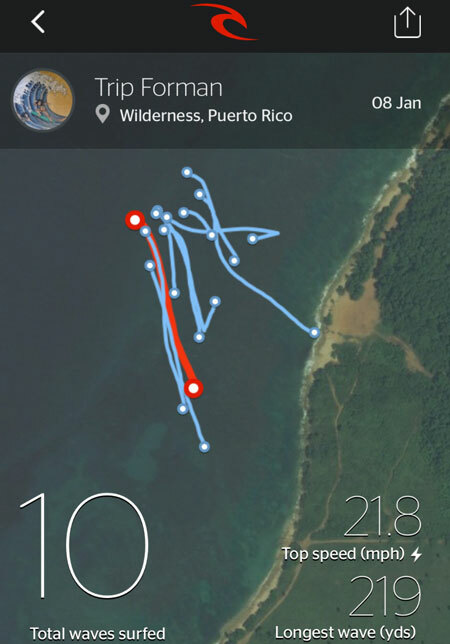 When you’re up and surfing, your fins are over 50% of the wetted surface on your board. So needless to say, when surfing bigger waves, you don’t want to trust the outcome of your session to plastic fins that flex and then never flex back. There’s a lot going on in big wave fin design and the fins that come up the most when talking about bigger wave quads are the Futures EA Quads. 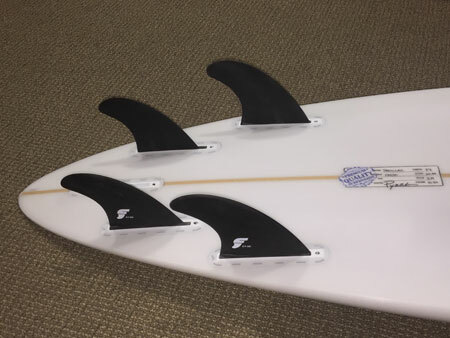 When Pat Rawson, Maurice Cole and Jon Pyzel all recommend these fins, you know they’re the right ones to go with. These fins are made from solid fiberglass to prevent them from breaking and also to create the correct flex pattern when surfed at higher speeds. 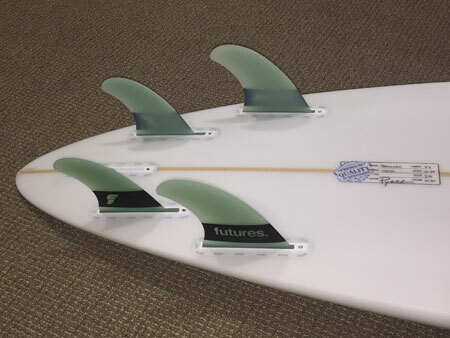 Futures is now also making a similar Paddle Gun G10 fin set out of solid G-10 material, adding even more strength and allowing them to go with a thinner foil for added speed. 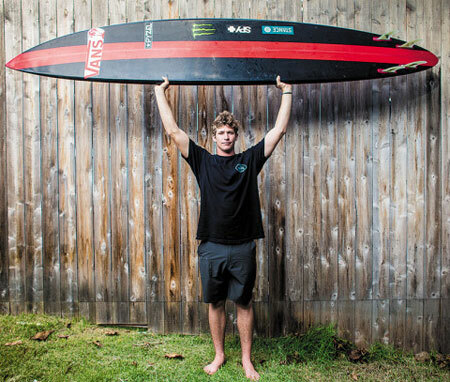 Nathan Florence with Futures Paddle Gun G10 fins in his Pyzel Padillac. Photo: Surfing Magazine. 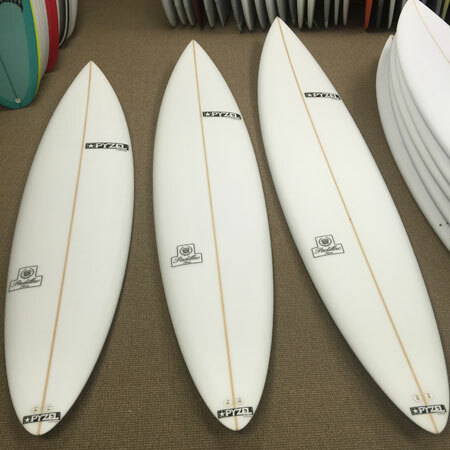 These G10 fins are pictured on Nathan Florence’s Padillac in the recent Surfing Magazine article. They are also available in Futures Pipe Gun G10 Thruster setup. 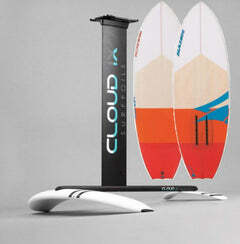 These two fin sets are state of the art, big wave equipment. Futures G10 Paddle Quad Fins in the Pyzel Padillac. 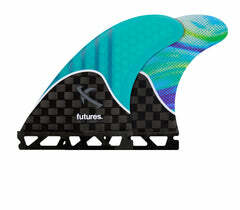 If you’re using fins out of your existing quiver, the Futures Mulcoys also worked well both in quad and tri fin set ups. You’re looking for a big wave board for tracking down sets and scraping into them. The Padillac has the paddle power, combined with high-speed control, to make bigger wave surfing a lot more accessible (and fun) than it feels on your smaller boards. 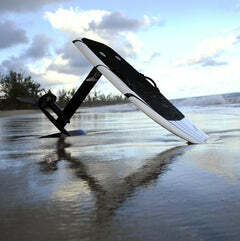 The Pyzel Padillac is designed for larger, deep water waves where paddle power and control at speed are key. The Padillac is a smaller version of our Crazy Train model gun. Like the name implies, this board is a paddle machine with extra thickness and a fuller outline than our standard guns so you can ride bigger waves with confidence and ease. 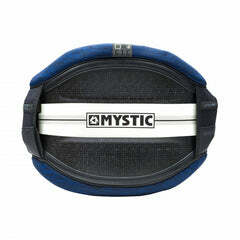 It has a clean, flowing rocker and light vee with double concaves to add speed and quick turning. 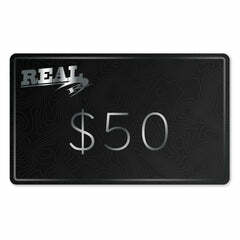 We recommend you go with the Quad option, and take this board out in most anything the ocean throws at you. Made in sizes between 6’10” and 8’6”. A great board for deep water waves like Sunset, Cloudbreak, or Ocean Beach, it is also a good choice for bigger surfers for lots of different waves around the world.